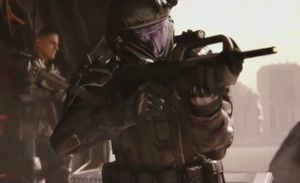 Butkus was a UNSC Marine and Orbital Drop Shock Trooper stationed at Earth in 2552. He was part of the 7th Shock Troops Battalion. Butkus and his squad taking cover. During the Battle of Earth, his squad was dispatched from the UNSC In Amber Clad to relieve the ground forces. Their D77-TC Pelican was shot down over Old Mombasa by a Type-47A Scarab walker. He survived the crash, but his squad was soon attacked by a Covenant patrol. He was nearly killed by a Kig-Yar Sniper, but Butkus managed to just avoid the shot. A Special Operations Sangheili then tried to sneak up on him with a Type-1 energy sword. Butkus' rifle was destroyed and he himself narrowly dodged the attack and fell to the ground, picking up a Type-25 plasma pistol and charging it. As the Sangheili took Jones hostage, Butkus was able to shoot the Sangheili and save his squadmate. His squad then met up with John-117 and helped him to chase down and destroy the Scarab. He is presumed to be alive, since his CO Gunnery Sergeant Stacker had returned to In Amber Clad afterward, although he and other members of Stacker's squad weren't mentioned later. Butkus is named after the Bungie employee John Butkus. He worked on the animations and cinematics for Halo 2. Butkus used a dropped Plasma Pistol to take down a Sangheili's shields, followed by a Battle Rifle burst from Stacker. This is commonly referred to as the Noob Combo. Butkus alerts Jones to a Kig-Yar Sniper. Butkus and Walpole take aim.